Chlorine granules are a fast-dissolving, stabilized (organic) disinfection and algae control agent for soft and hard water.Chlorine shock can be used as the first dose in a new pool, as continuous dosing every other day or as shock treatment if the pool water is seriously out of balance. Chlorine granules are a fast-dissolving, stabilized (organic) disinfection and algae control agent for soft and hard water. Chlorine shock can be used as the first dose in a new pool, as continuous dosing every other day or as shock treatment if the pool water is seriously out of balance. 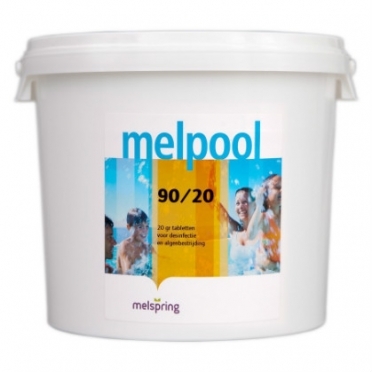 Melpool 90/20 chlorine tablets are a slow dissolving stabilized (organic) disinfection and algae control for soft and hard water.Chlorine tablets are used for continuous dosing of your swimming pool.Never add chlorine tablets directly to the water, use the chlorine floater or skimmer from your pool.When chlorine comes into direct contact with your pool, the pool liner may discolor. 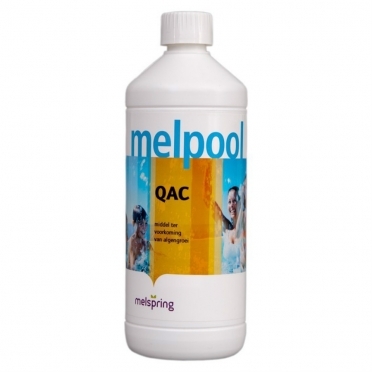 Melpool 90/20 chlorine tablets are a slow dissolving stabilized (organic) disinfection and algae control for soft and hard water. 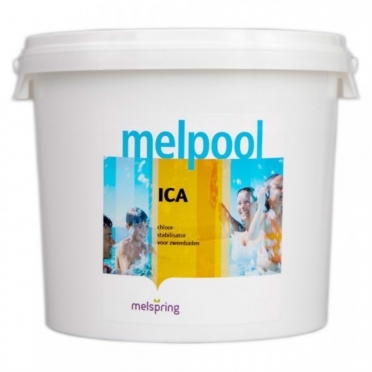 Chlorine tablets are used for continuous dosing of your swimming pool. Never add chlorine tablets directly to the water, use the chlorine floater or skimmer from your pool. When chlorine comes into direct contact with your pool, the pool liner may discolor. 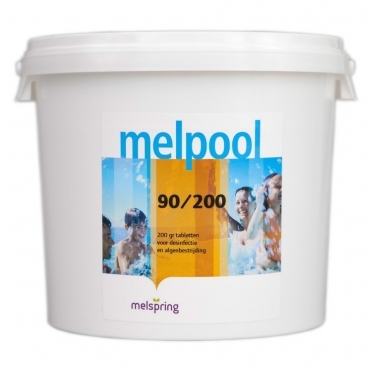 Melpool 90/200 chlorine tablets are a slow dissolving stabilized (organic) disinfection and algae control for soft and hard water.Chlorine tablets are used for continuous dosing of your swimming pool.Never add chlorine tablets directly to the water, use the chlorine floater or skimmer from your pool.When chlorine comes into direct contact with your pool, the pool liner may discolor. This product prevents cloudy water by merging the very small floating particles in the water into larger particles, which are then easily absorbed by the filter.Packed in cartouches (bags).Place one cartouche in the skimmer per 20-40 m3 of water.One package contains 8 cartouches (bags). 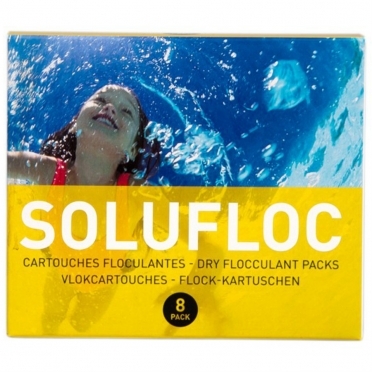 Flocculant in gel form for continuous flocculation.Great for pools with underwater lighting. The water becomes crystal clear.Place the SuperCubes in the skimmer.If a lot of leaves are falling in the pool, you should put the SuperCubes in the supplied pouch and place the pouch in the skimmer.Otherwise leaves will stick to the Super Cubes.One SuperCube per 40 m3 is sufficient for approximately four weeks. Organic chlorine stabilizer (cyanuric acid) in granular form.Prevents rapid decrease of the chlorine level.Note: Only use in combination with Melpool 70/20, Melpool 70/G, liquid chlorine and electrolysis systems.Do not use this product with stabilized disinfection products. 100 g of stabilizer per 10 m3 of water increases the concentration with 10 PPM.Avoid concentrations above 100 PPM. 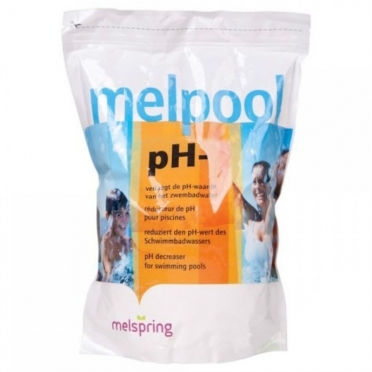 Melpool pH- powder - 2 kg is ideal to lower the pH level of your pool or spa.Depending on the alkalinity of the water adding 40 to 100 grams per 10 m3 drops the pH value to 0.1.The appropriate amount can be determined incrementally.Start with about 80 grams per 10 m3 of water and check if the pH value is lowered sufficiently.The pH value should be between 7.2 and 7.6.Note: Don't add more than 300 g per 10 m3 per treatment. 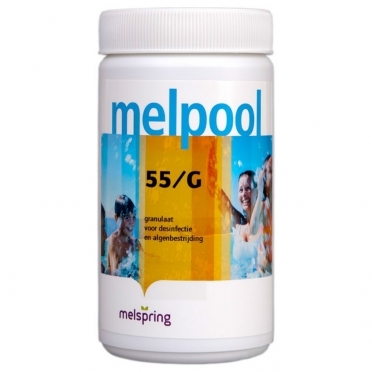 Melpool pH- powder - 6 kg is ideal to lower the pH level of your pool or spa.Depending on the alkalinity of the water adding 40 to 100 grams per 10 m3 drops the pH value to 0.1.The appropriate amount can be determined incrementally.Start with about 80 grams per 10 m3 of water and check if the pH value is lowered sufficiently.The pH value should be between 7.2 and 7.6.Note: Don't add more than 300 g per 10 m3 per treatment. Melpool pH- powder - 10 kg is ideal to lower the pH level of your pool or spa.Depending on the alkalinity of the water adding 40 to 100 grams per 10 m3 drops the pH value to 0.1.The appropriate amount can be determined incrementally.Start with about 80 grams per 10 m3 of water and check if the pH value is lowered sufficiently.The pH value should be between 7.2 and 7.6.Note: Don't add more than 300 g per 10 m3 per treatment. 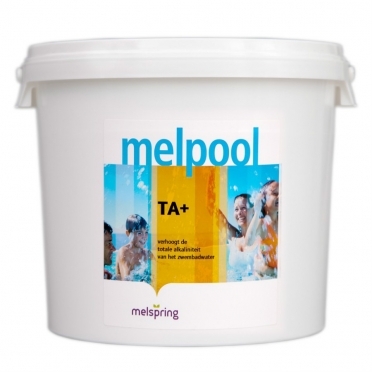 TA+ powder to increase the total alkalinity (TA) of the water to stabilize the pH level.150 g of this product per 10 m3 of water increases the TA with 10 PPM.Keep the TA level between 100 and 150 PPM.Note: Do not use more than 300 g/10 m3 per treatment.Dissolve the powder in a bucket of water and then spread evenly over the surface. 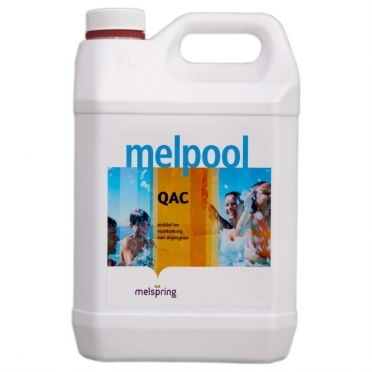 Liquid algicide for algae control and prevention, foam-free.In order to prevent the growth of algae use 300 ml per 10 m3 of water for the initial treatment.After that use 80 ml per 10 m3 of water every 5-7 days.In case of visible algae (greenish water), first super chlorinate the pool(chlorine shock treatment) and after dose with 530 ml per 10 m3.Note: Do not dispense too much! Liquid algicide for algae control and prevention, foam-free. In order to prevent the growth of algae use 300 ml per 10 m3 of water for the initial treatment. After that use 80 ml per 10 m3 of water every 5-7 days. In case of visible algae (greenish water), first super chlorinate the pool(chlorine shock treatment) and after dose with 530 ml per 10 m3. Note: Do not dispense too much! Melpool PAC binds fine, suspended particles into larger flakes, which can be removed from the water by the sand filter or a pool vacuum cleaner.This flocculant is very effective when dead algae needs to be removed.The liquid flocculant (active from pH 5.0 to pH 10.0) is dosed into the skimmer or overflow channel.Repeat the treatment until the water is crystal clear. One or more times per week 10 ml per 10 m3 of water.With an increased cloudiness of the water this dose should be doubled or tripled.Note: Do not dispense too much!An overdose causes the opposite effect.